Three types of custom magnets for crunchy, crisp, clear & defined lower strings - sweeter, creamier, milkier higher strings for a richer sound. Custom designed with Bernard Sumner of Joy Division / New Order. We worked on the design of this pickup together when he wanted something edgier from the Gibson LP Jnr Double Cutaway he picked up. He has a number of vintage guitars (and old Vox amps) but wanted something different for the new live dates and recording. We spent time playing his old original Gibson ES 330 that just sounded perfect, just a really sweet yet gritty sound that really snarled when pushed. It has Dogear P90s but they just had something more than the standard P90 sound but the two issues he had where, it had just been too precious to take out on tour for a number of years and with it having single coil P90s, it hummed, both live and in the studio with all the synths & equipment. In comparison, his Gibson SG and the early 90s LP Jnr he picked up just sounded a little sterile in comparison. So the task was not to recreate the sound of the ES 330 but take its characteristics and make a similar Dogear P90 size pickup to fit the new LP Jnr that kept the colour and edge to the sound but with clearer, more defined and ‘punkier' lower E, A & D strings whilst somehow being warmer, creamier & milkier on the higher G, B & E strings. So rather than try and make some kind of hum-cancelling P90 we decided to just start again from scratch and make a new design of pickup to balance these two ideas, clearer, more defined & crunchier E, A & D strings whilst somehow being able to roll off the treble slightly on the higher G, B & E strings for less of a single coil sound and more towards the richer, fuller humbucker sound. To get the crisper, crunchier lower notes in a humbucker often means less coil and a lower output which can give the higher strings more treble - the task was to reconcile these two ideas, clear, crunchier lower strings with warmer highs with a higher output to push the amp a little more. This is where the unique design came about after a few different prototypes - Individual sets of custom made & sized threaded rod magnets of opposing polarity and different strengths underneath the lower E, A & D strings with a double pole humbucker design underneath the G, B & E strings, again with custom made magnets hidden away underneath the offset coils for these strings. Outputwise, we wanted it to really push his naturally brighter vintage VOX AC30 amps for a really attacking, edgier sound. After the gigs, and with the pickup performing well onstage he asked me to make a bridge & neck humbucker sized set to the same spec for his ’62 SG - These are the same ones. He took these back out on the road and gave them a good road test on the short US tour later that month and his final review was, "Back home now and gave the pickups a good trial on tour. Verdict fantastic! Improved both my guitars. The humbuckers have bags of tone and character! The old Gibson ones sound cold and neutral in comparison. Totally pleased. You’ve sure done something right and well impressed the band, me and the crew! I’ve been bigging you up to everyone!" A great replacement humbucker for a standard Jazzmaster size/shape. The magnets under the lower E, A & D strings are custom sized, custom made threaded Alnico 5 whereas the lower G, B & E strings can have either Alnico 2 or the stronger Alnico 5 - Alnico 2, being a little weaker 'holds' the strings a little less, allowing them to vibrate a little more, adding a little more warmth to the overall sound whereas Alnico 5, being that bit stronger, 'holds' the strings a little more for a little brighter attack & focus. 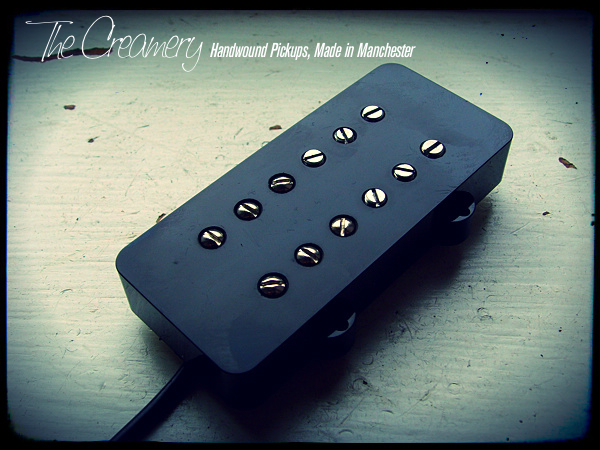 You can find more details of my Creamery Custom Shop Handwound Replacement Jazzmaster Pickups here.